Imagine camping, embarking on a journey up the mountains or hiking the hills when playing on the Climb and Discover Cave. The dual entry cave encourages users to crawl under and experience the detailed turtles, lady bugs, birds, mushrooms and other foliage decorated throughout the interior. The tough exterior features numerous colorful alpha-numeric hand and foot grips which challenges strength, coordination and physical endurance through climbing. 4 strategically spaced and molded-in seats provide a comfortable place to rest, relax and socialize. Designed to be environmentally friendly, the freestanding Climb and Discover Cave is constructed entirely by durable recycled plastic and steel materials. 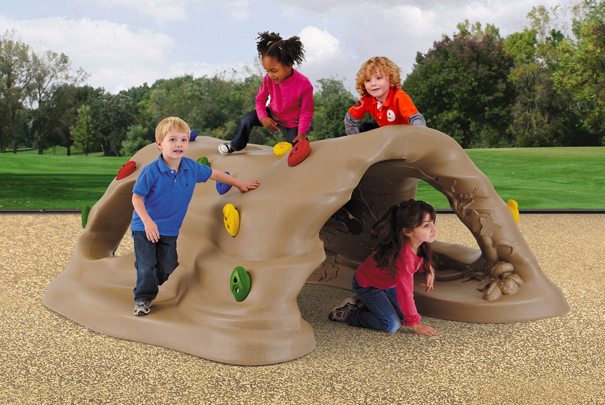 Great for playgrounds, schools, daycares or residential use, this versatile play component offers children 2 to 12 years old opportunities for fun, growth and development.